This DIY candy cane vase makes an easy holiday decor project that is as much fun to put together as it is to display. 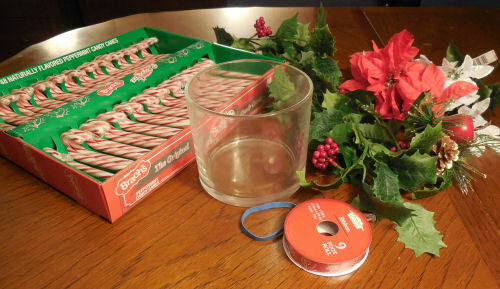 All you need are some candy canes and a few inexpensive supplies. 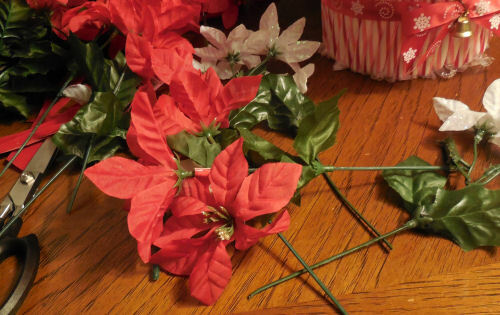 Grab some peppermint sticks and let’s make a new Christmas decoration. 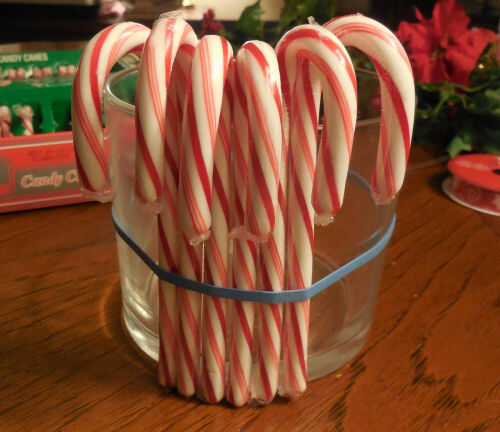 This DIY Candy Cane vase is easy and quick to do and looks great on the table. 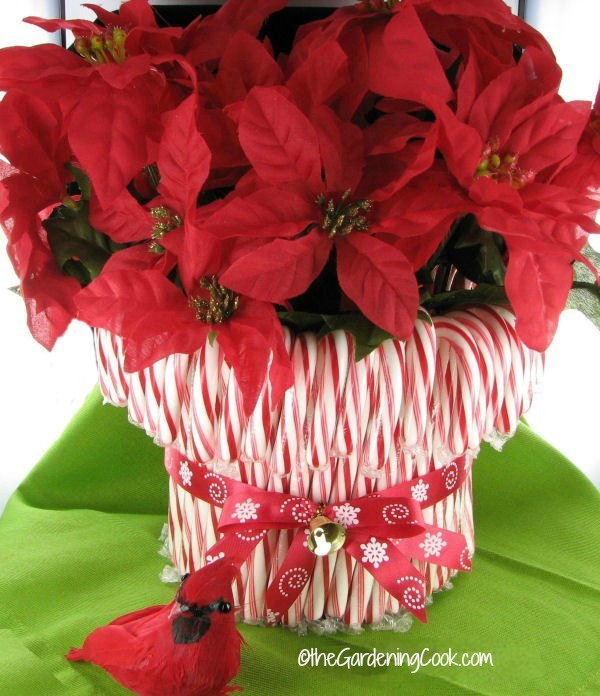 It will hold any type of floral decoration in the top and makes a great centerpiece for a holiday party table. at appeals to me. The project doesn’t even need glue so there is no mess or fuss. 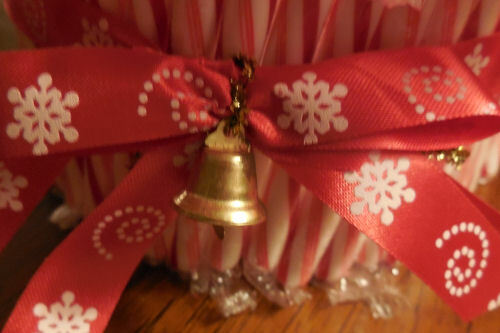 I used a glass vase that was a bit shorter than the length of the candy canes, a roll of holiday ribbon about 3/4″ wide, a box of regular sized candy canes, one large elastic, and some floral faux decor that I got at the dollar store. 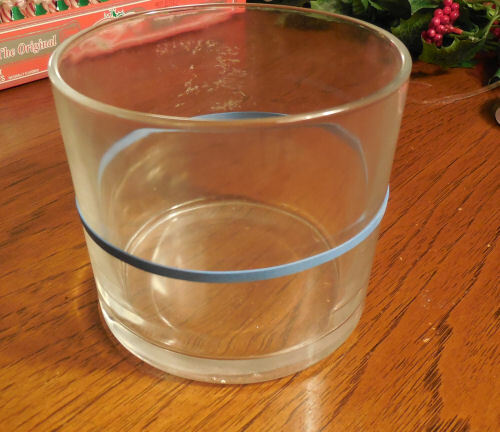 Place your rubber band around the middle of the vase. Mine fit quite snugly. 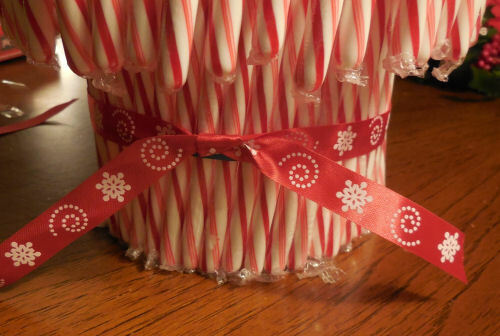 Slip the candy canes behind the elastic and level with the bottom of the jar. Keep going until the jar is covered. 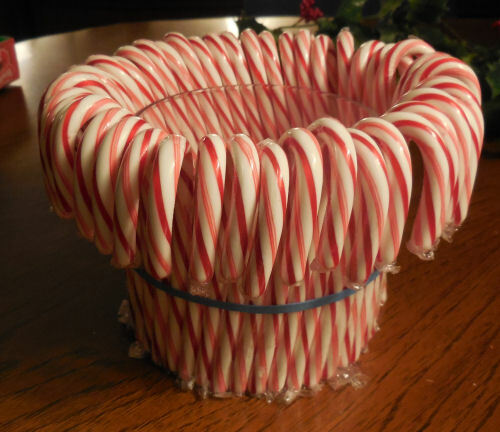 I used 40 candy canes. 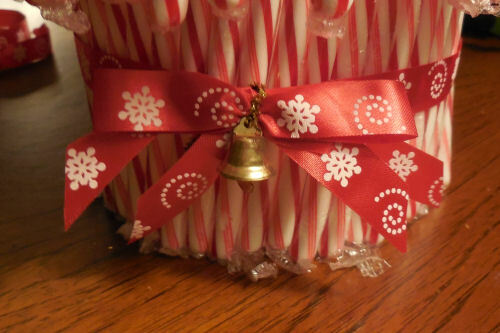 Add a length of the holiday ribbon around the jar over the top of the elastic so that it hides it. 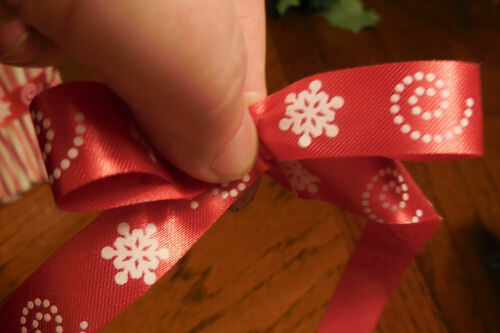 Take a piece of the ribbon and make two loops and pinch them in the middle. Add a longer piece of ribbon at the back of the loops and pinch it also. I used an old bell from a dollar store bow that I had on hand to twist around the bow to secure it, and then tied the bow to the front of the jar. Trim the ends of the bow. The elastic is perfectly hidden now. I had a large faux poinsettia sprig that I cut into several lengths that were the right size for the vase.Finished vase ready to display. 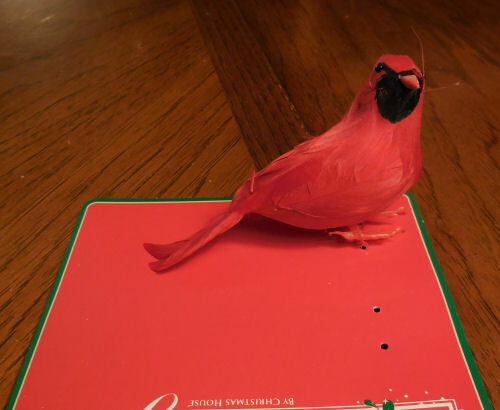 A little Dollar store bird makes a great companion for the candy cane vase. The vase looks great in the middle of a server tray with his bird buddy! 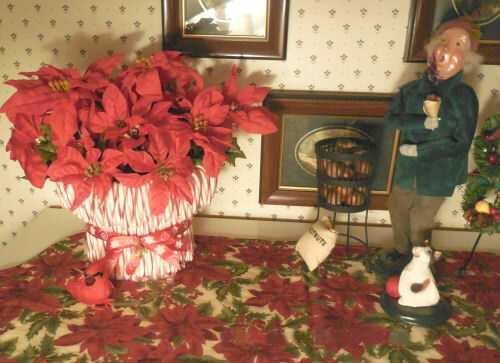 Candy cane vase displayed with one of my Byers Choice Carolers. That’s it! 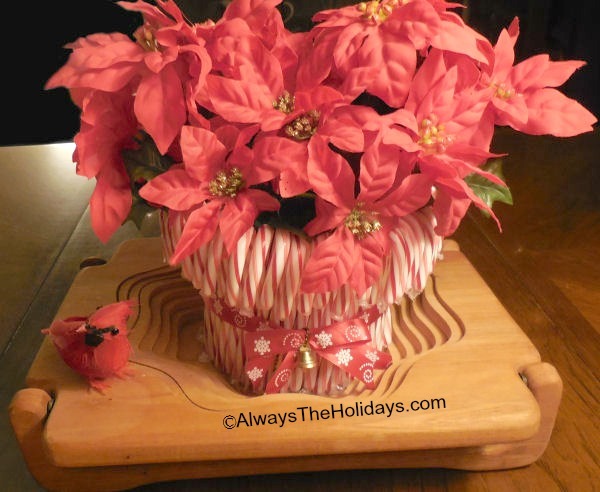 Fast, easy, fun and great looking easy holiday decor project. There should really be a way to print these things. Would the glass slip out if you pick up the vase?